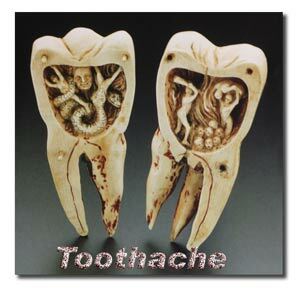 Tooth replacement concerns have existed since ancient times. 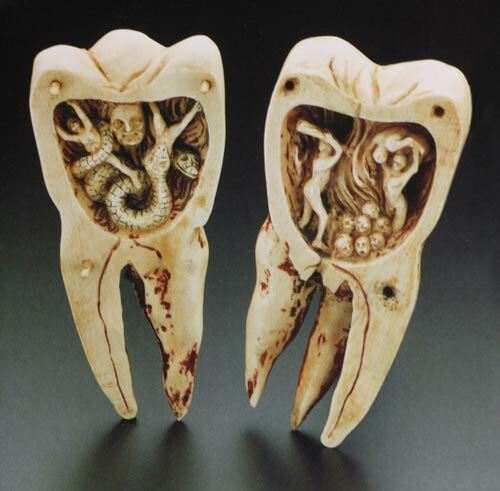 Teeth symbolize health, beauty, status and vigor. Many animal species would die of starvation if anything happened to their teeth or jaws. A cheetah for example will abort a chase if there were any danger of suffering an injury from a kick to the teeth or the jaw. That would mean a death sentence. In humans, technology has allowed us to survive tooth loss, whether it involves processing our foods so chewing is not required, or by the fabrication of “prosthetics”, or tooth replacements. Despite our advanced technology of today, however, everyone knows that it is never the same when you lose your teeth. Because of the fundamental importance of our teeth, they are wired to the most primitive parts of our brain. Any discomfort or threat to our teeth is perceived as highest priority through our deepest emotional brain centers. For this reason toothache and jaw-joint problems are associated with deep sensations of fear and mood alteration over which most people have no conscious control. The area of our brain surface devoted to the teeth, mouth and tongue is disproportionately larger than any other area of the body. The last ten years has seen a major advance in material technology, including metal-free options for tooth replacement. Metal-free crowns and implants are the latest innovation, allowing humans to restore their damaged or lost teeth with materials that mimic nature as much as possible. The Maya used specially carved and shaped shells and inserted them into the jawbone. The calcium carbonate in the shells allowed for some integration with bone. The ancient Egyptians also used ivory and shells to implant in jawbones. 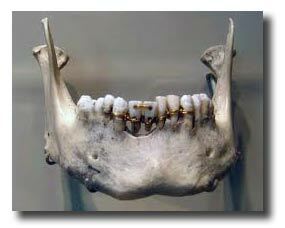 The ancient Phoenicians and Egyptians used gold wires to attach false teeth to adjacent teeth. 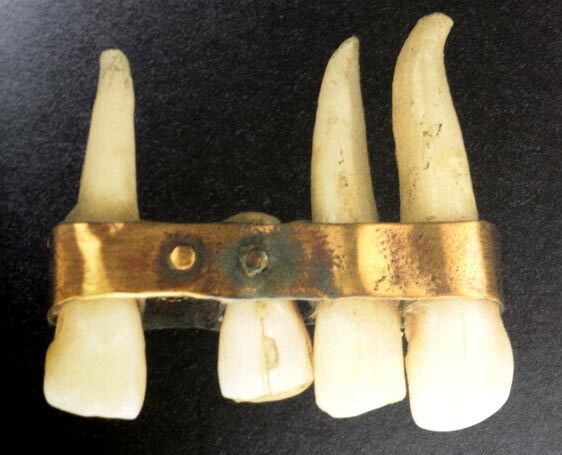 The ancient Etruscans used false teeth riveted to gold straps which were fastened on adjacent teeth and acted as the first “bridges”. Metals have been used for decades as implant materials or prosthetics. Crude and invasive versions of dental implants more than forty years ago were not too predictable and many times resulted in failures and disfigurement. The main problem back then was the lack of osseo-integration, a word that describes bone growing against the implant. In 1952, Per-Ingvar Brånemark discovered that titanium could integrate in living bone. The first titanium implants were placed in humans in 1965. A new era had dawned upon implant dentistry. Surface treatment of the implants with titanium plasma or hydroxyapatite improved their integration and by the 1990’s implants were used extensively throughout the world. 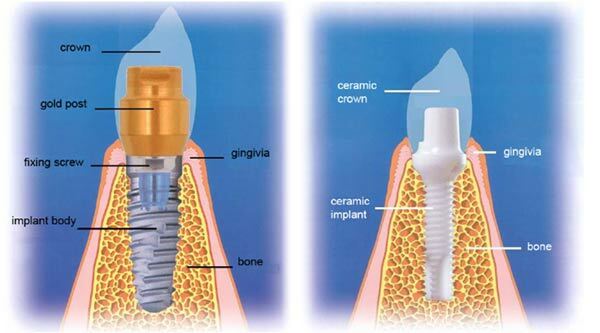 A very firm and stable implant could now support a crown and survive for years without failing. Despite these advances, more and more people kept looking for metal-free options. 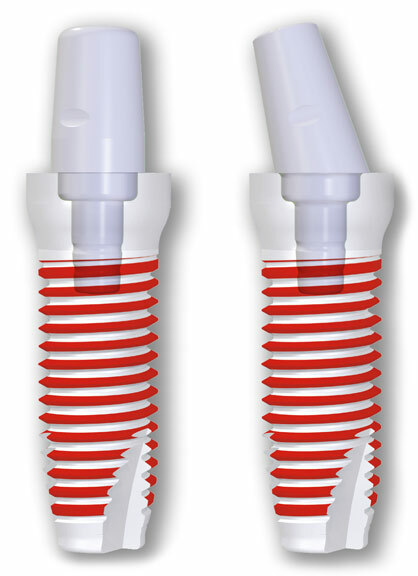 Ceramic implants were not reliable, until 10 years ago, when the Swiss developed a type of Zirconia ceramic that was strong enough to use as dental implants. 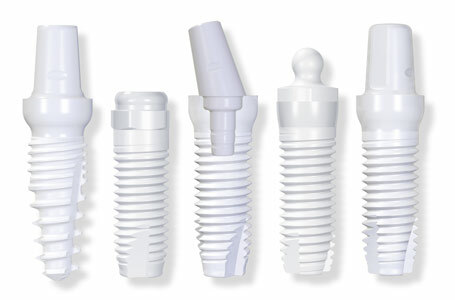 This type of ceramic was being used successfully as hip implants.